Oris group shot in front of a Williams F1 nose. From left to right: 42 mm Divers Heritage 65, Williams Chronograph Carbon fibre Extreme, Artix GT Chronograph and a Carlos Coste Limited Edition ProDiver Chronograph. Grand Prix week in Montreal is huge. If Formula 1 is the most glamorous and high profile sport in the world, and Monaco is the premier race, Montreal is certainly second in terms of pizazz. It is a favourite among the F1 community for its urban location, high-end nightlife and passionate fans. Formula 1 is wonderful for watches with all of its mechanical aspects and co-branding and sponsorships. 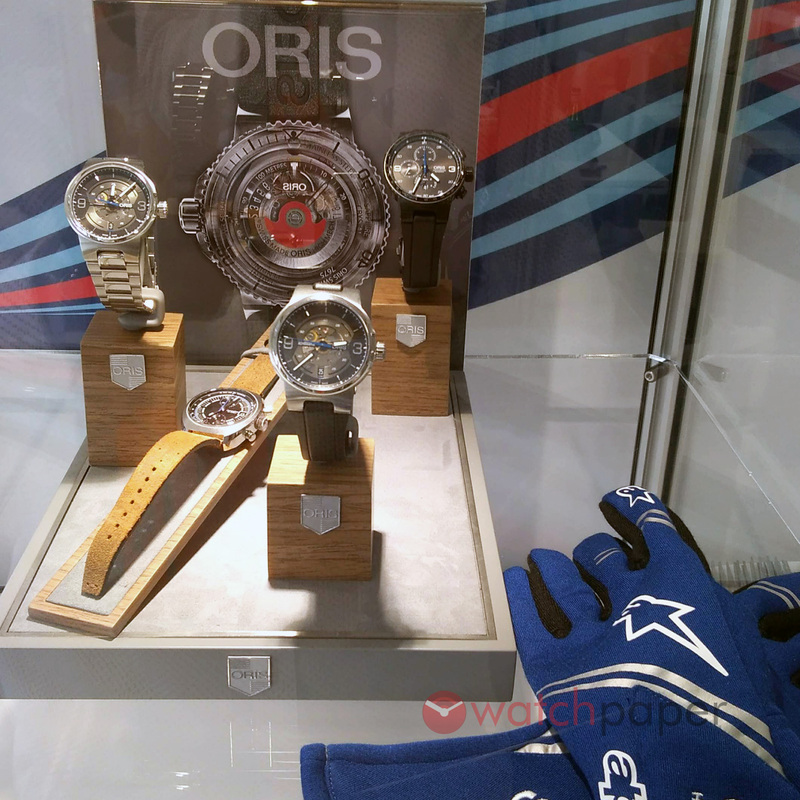 And you saw our weekend with Oris last year. 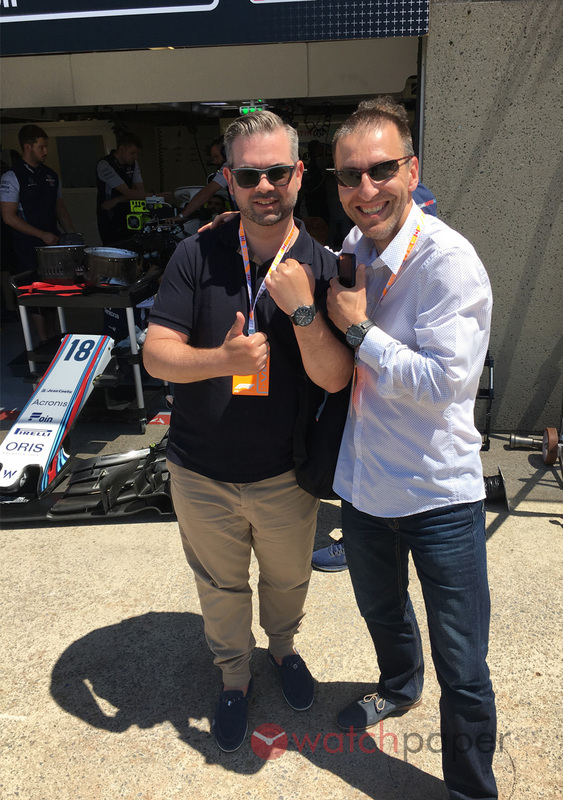 Well, this year we got invited to attend the Friday free practice sessions in the Williams paddock as guests of Williams sponsor, Oris. Twenty-seven years of attending the Grand Prix as a spectator could not prepare me for the Paddock Club. After walking down a special runway and passing through electronic security turnstiles, we entered a fantasy world that millions of people can only dream about. As practice had already started, we were shown straight into the back of the Williams garage in the pits. We were given headsets to listen to the drivers’ communications with the engineers over the radio. Let’s pause now and try to comprehend the enormity of this. The Grand Prix in Montreal turns 40 this year, just like me. 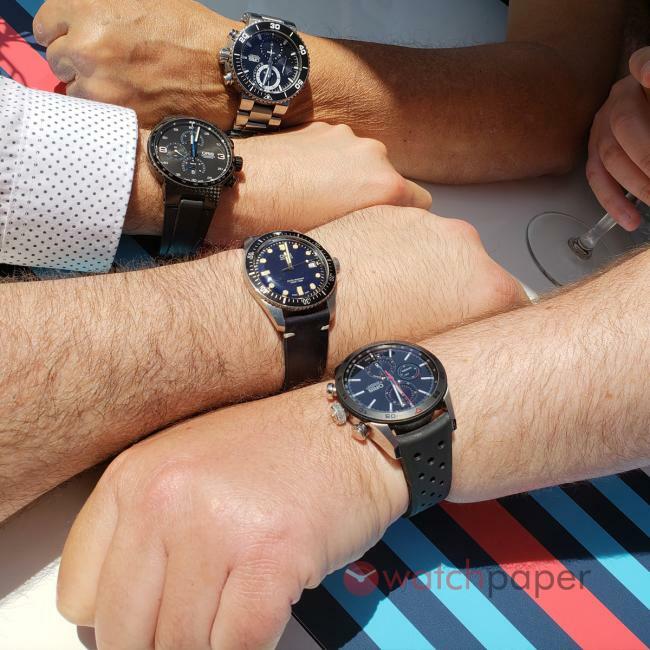 And I was wearing my 40th birthday piece- an Oris Artix GT Chronograph. 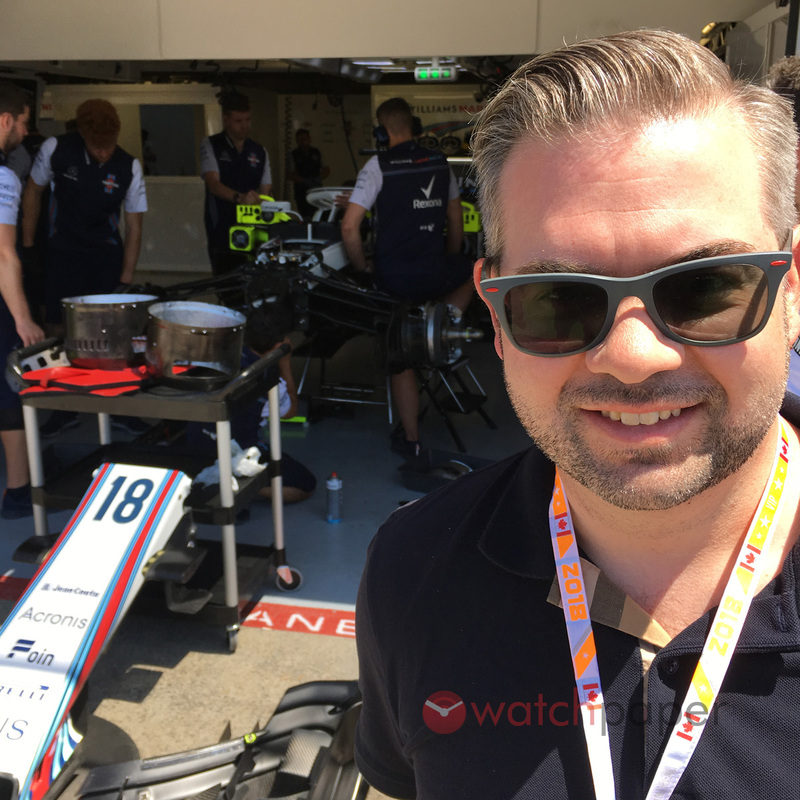 After 30 years of obsessively following F1, I was standing inside the Williams pits, watching my countryman, Lance Stroll, enter and exit the pits in his F1 car. I was beside myself. And it was about to get even more incredible. I grew up with an unhealthy obsession with Ferrari. My life revolved around Ferrari and watching F1. I visited Maranello with my dad. I even drove to my wedding in a red Ferrari. To get anywhere near the Ferrari team during a Grand Prix weekend was beyond a fantasy. 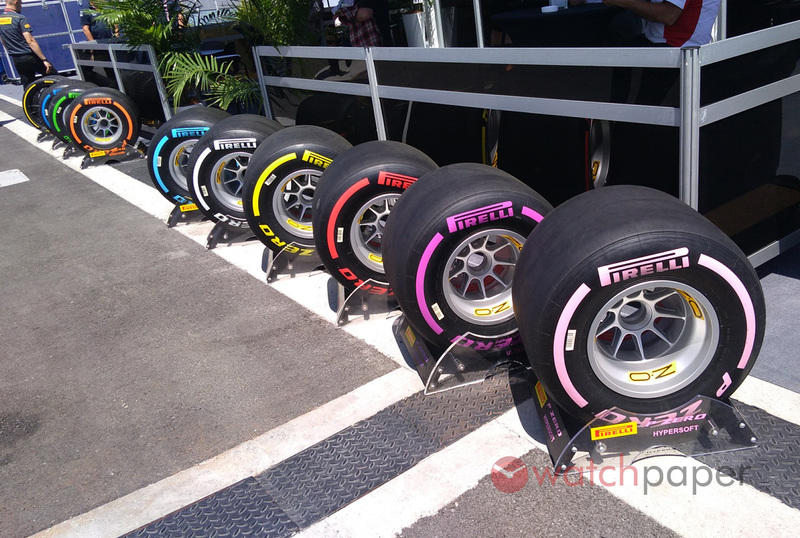 You won’t find these in the Canadian Tire catalogue, the entire lineup of Pirelli F1 tires, with the latest Pink Hypersoft in the front. One of the other guests in the Williams paddock knew I was a tifoso (i.e. Ferrari supporter) and he casually asked me, “Would you like to see the Ferrari garage?” It turns out he has friends in the Ferrari team and they let him bring me inside the garage with him! As we entered the Ferrari garage, out came Kimi Raikkonen in full racing suit and helmet. I was right there inside the Ferrari garage, ten feet away from the cars as the team worked on them before sending them back onto the track. I turn to my right to speak to my new best friend in the world, and my jaw literally dropped. I found myself standing beside Sebastian Vettel as he watched lap-times on the big screens. At this moment, all I wanted to do was travel back in time 20 years and show this moment to myself. How I wish I could show that young man what awaits him in twenty years. He would pass out in shock. In fact, I nearly passed out in the pits! Of course, no phones or cameras are allowed in the F1 pits, so all I have are mental images. But they will stay with me forever. The Ferrari boss who let me in even asked if I was in the watch business. So I told him about WatchPaper! Can you believe that!?!? After decades of fanatically following Ferrari and F1, I was standing with the team as their superstar drivers came in and out of the pits. This was a huge moment in my life and a memory that will stay with me always. After the first practice, we joined our friends in the Williams paddock. We had drinks and gourmet food and discussed watches. We even walked down pit lane. 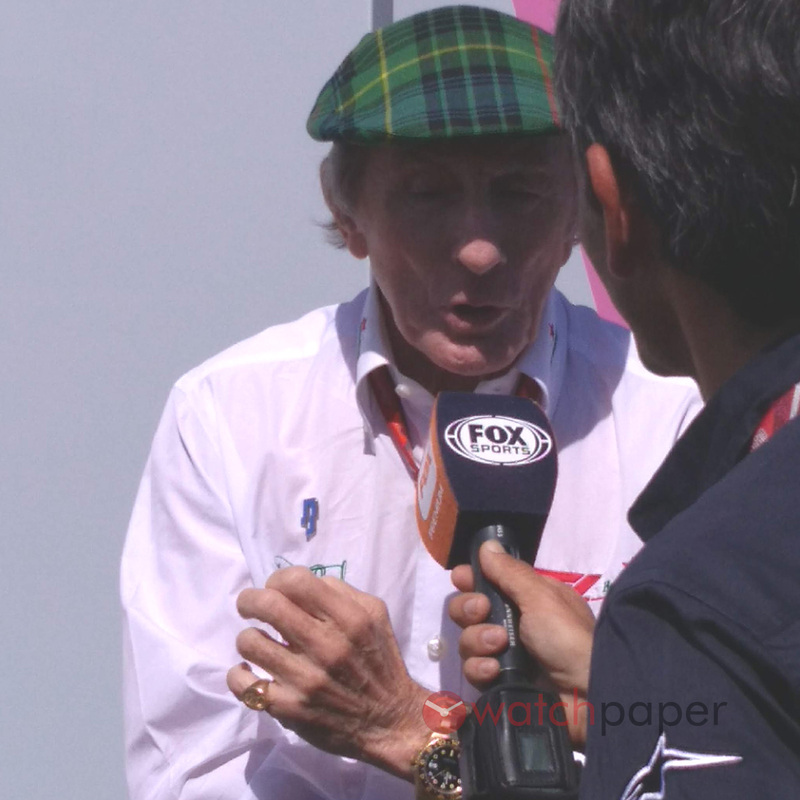 Over the course of the afternoon, we saw Toto Wolff, Sir Jackie Stewart, Christian Horner, Damon Hill, Jacques Villeneuve, and more. 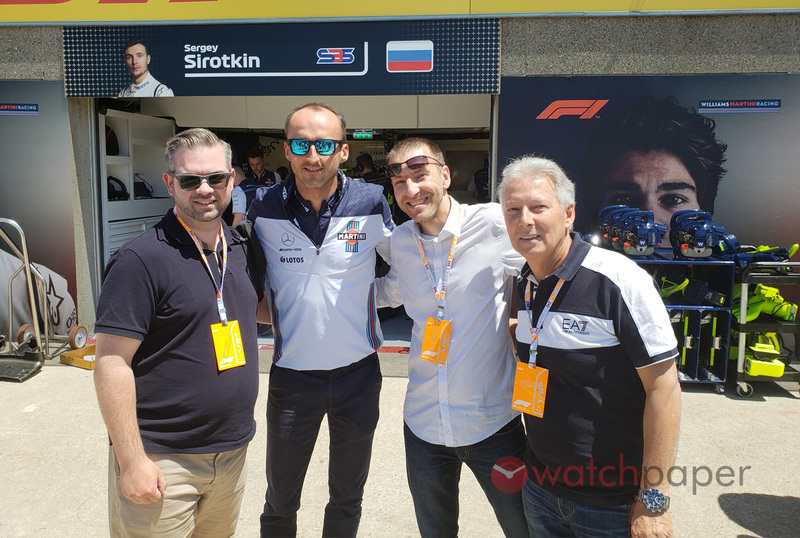 And there was Robert Kubica. Robert Kubica had a huge shunt in Montreal about ten years ago. The accident happened right before my very eyes at the hairpin. Miraculously, Kubica was not killed. The following year, he actually won the race in Montreal. Here he was- posing for photos with us and signing our VIP passes! I tease Adam all the time about #bloggerlifestyle. The entire world is watching Montreal this weekend and we were in the middle of the Paddock Club with all the celebrities and VIP. It was like waking up in some altered reality. In my wildest dreams, I never even imagines such a thing. Think about it – the Williams F1 team served us lunch! That’s amazing! A couple of watch bloggers from Montreal found themselves being taken care of by a legendary F team! Ha! And all of this was made possible by Oris. Of course, I was thrilled that I was wearing my brand new Oris Artix GT Chronograph for this amazing experience. 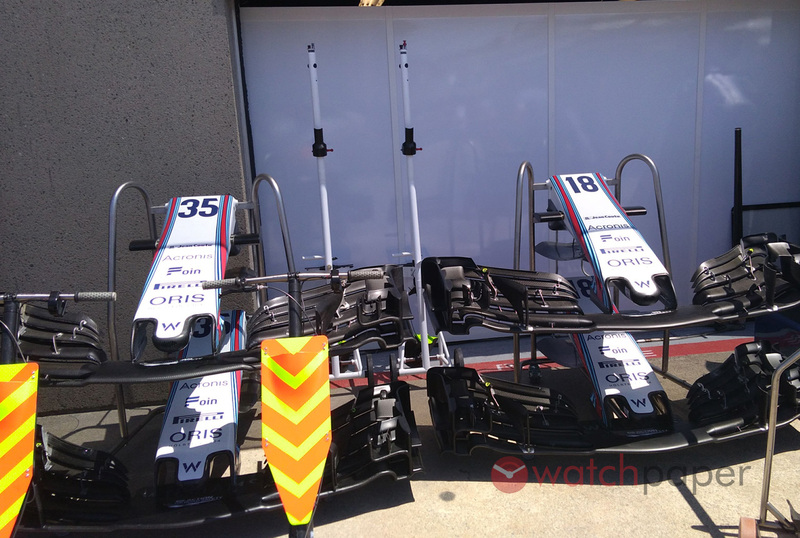 Williams F1 nose and front wings. And here I sit writing about it in my notebook while sipping a single malt scotch on my back deck. I’m still trying to process the information – that’s how huge it is. 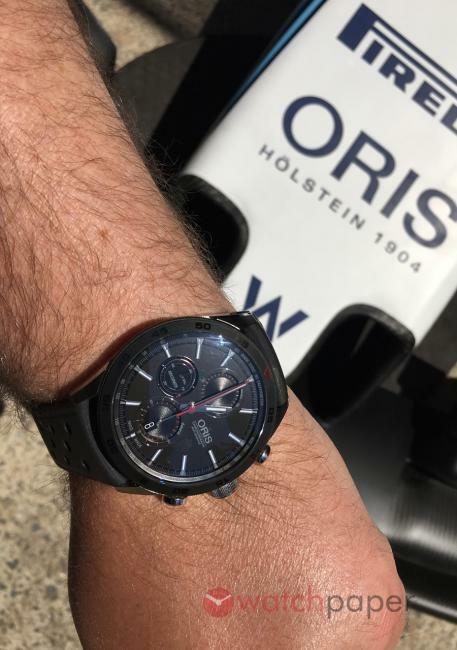 Wearing my own brand new Oris racing chronograph during the whole thing was just so appropriate. I had the ultimate timepiece for this day. We were VIP. We were in the glamorous center of a live F1 event. We were also talking watches all day! This experience was one of the highlights of my life. 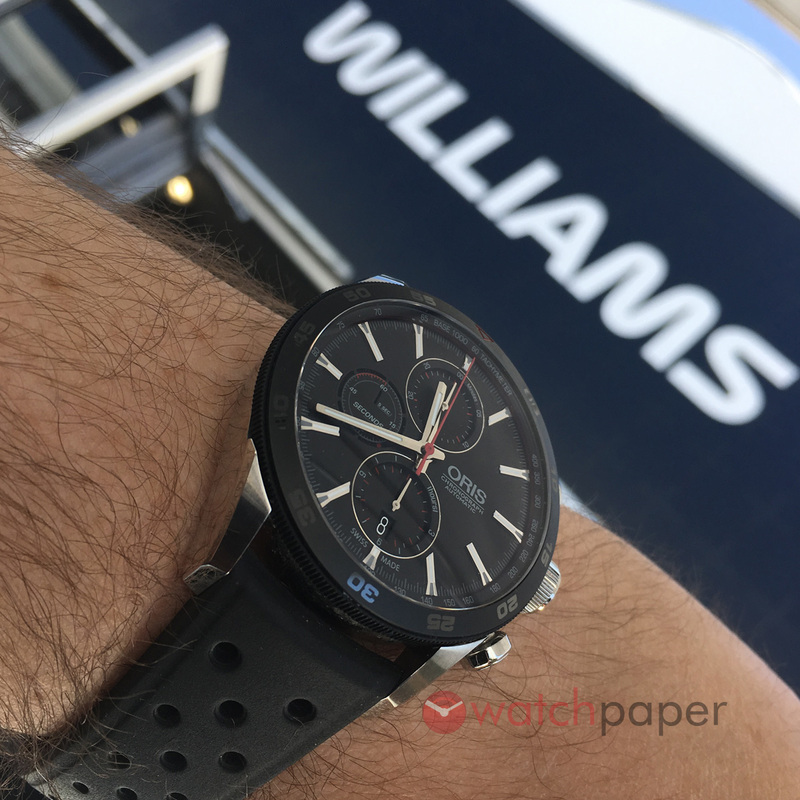 I sincerely thank Oris and Williams for making this happen. I didn’t tick anything off the bucket list yesterday. I ripped up the bucket list and threw it away. 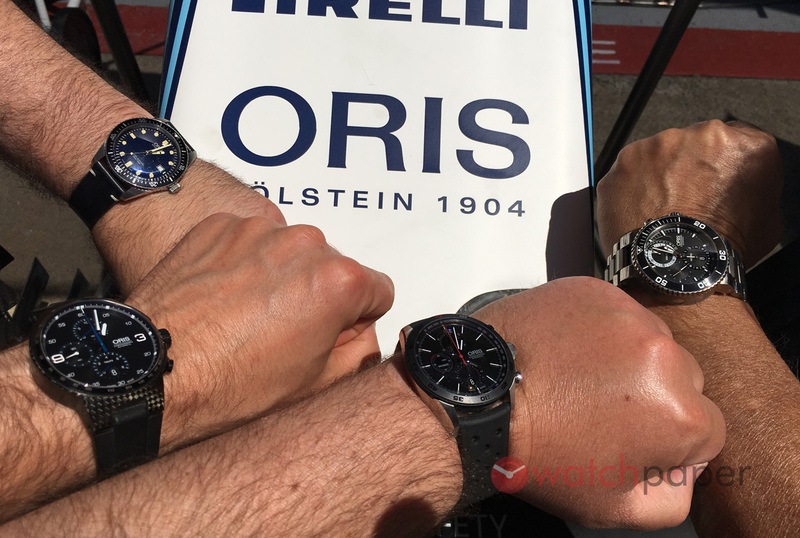 Oris at the power of four!